Among the oldest known textiles, silk was produced in China as early as the mid-third millennium B.C.E. The discovery that silk filament produced by silkworms could be spun into yarns and woven into textiles was later attributed to a legendary Chinese empress who was worshipped as the Patron Diety of Weaving. This account of silk's origins is purely mythical, but it perhaps demonstrates an awareness of both the antiquity of silk production and its importance to Chinese culture. Sericulture, the term used to refer to all aspects of silk production from the raising of silkworms to the spinning of yarn and weaving of cloth, was subject to state control for many centuries, and it was forbidden to export silkworms or reveal the secrets of sericulture outside China. Bolts of silk textiles, produced to standard width and length, were used in ancient China as official trade goods, and were accepted in payment of taxes. Gradually a trade also developed in silk produced for private use and commerce. According to legend, in C.E. 553, some Nestorian Christian monks returned from China to Byzantium with silkworm eggs and a knowledge of silk production; whether this story is precisely true or not, the silk industry that was transplanted to Western Asia around that time became a major contributor to the wealth of the Byzantine Empire and a source of its leadership in the production of royal and ecclesiastical garments and furnishings. By the eighth century, sericulture had spread to northern Africa, Spain, and Sicily. Spain and Sicily became famous for weaving exquisite silks in what would later become known as jacquard designs. In the early Renaissance, silk production became well established across Italy with Lucca and Florence as major centers. Lyons, France, also became the center of a major silk-producing region. Attempts to create an industry in England struggled, however. An attempt to establish sericulture in the American colonies in the early to mid-nineteenth century failed, in part because of technical difficulties (such as diseases afflicting silkworms), and partly due to competition from cotton. Cotton was by then a major crop and cotton spinning and weaving were important industries, better suited than silk to the climate and industrial base of the United States. Over time, silk fiber production also failed or became uneconomical everywhere in Europe, leaving China, Japan, India and Thailand as the major sources of silk fiber in the world. Italy and France continue to produce high-quality silk textiles from imported fibers. 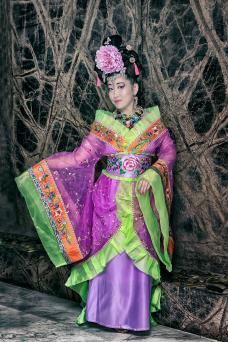 Silk textiles are also produced in commercial quantities in China, Thailand, India, and some other Asian countries. While silk accounts for only .2 percent of the global textile fiber market, raw silk is valued at about 20 times the unit price of raw cotton. Demand remains strong, and the value of this historically luxury fiber remains high, though the price varies with supply and demand, as with all commodities. Environmental stresses may be a limiting factor in silk production in the future, which would reduce supply and increase price. Like wool, silk is a natural protein fiber. The larvae of the Bombyx mori moth, commonly known as silkworms, extrude silk fibers to form their cocoons and simultaneously secrete a gummy coating known as sericin. There are basically two kinds of silk: wild silk and cultivated silk. In both cases, silk is produced when silk moths lay eggs that hatch into caterpillars that eat either mulberry or oak leaves and then spin their cocoons, resulting in silk fibers. Spinning the cocoon takes about a month of the larva's life and yields about a mile of silk fiber, which can be spun into as much as 1,000 yards of silk yarn. Wild silkworms feed on oak leaves. Wild silk is harvested by picking cocoons left behind when the moths break free. This can result in a short and uneven staple fiber often labeled Tussah silk. Raw and Tussah silks are used in fabrics that have a more textured appearance than typical cultivated silk. The majority of silk comes from a more controlled production process, known as sericulture, that extends over all stages of production, from the moths selected to lay eggs, to identification of the healthiest silkworms, to harvesting and processing of the best quality cocoons. 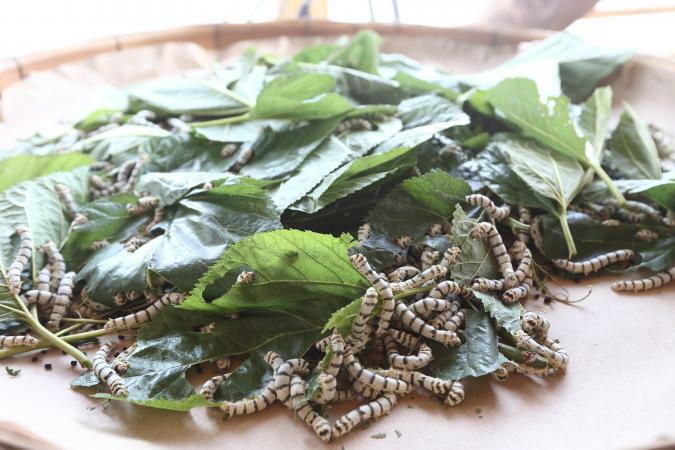 Domestic silkworms are fed mulberry leaves. A selection of moths deemed the best breeding stock are allowed to break through the cocoons and become part of the next cycle of silk production. A majority of larvae are killed with dry heat to prevent the moth from breaking open the cocoons and thus retain the long natural filament characteristic of silk. After soaking whole, unbroken cocoons in warm water to soften the gummy sericin secretion on the silk, a hand operation known as reeling combines the filaments from approximately four cocoons into one uniform filament yarn that is wound onto a reel. Reeled filaments are twisted together in a process known as throwing. Outer layers often yield broken yarns that are diverted to production of spun silk, also known as silk noil. If silk is left as raw silk (silk-in-the-gum), the sericin is not removed. However, most cultivated silk is degummed through use of a soap solution that dissolves the sericin and produces very smooth, uniform yarns. Scouring and bleaching may be necessary to get silk white enough for white or pale colors. This causes loss of weight. Weighting with metallic salts such as tin may be used to replace the weight. This practice has been found to diminish the strength and durability of silk fabrics and is required to be disclosed on the label. Dyeing is done at the yarn or at the fabric level. Some noteworthy aesthetic finishes demonstrate ways silk can be modified. Sandwashing silks produces a more faded, casual fabric that is washable. Sueded silk is a further processing of washable silks with alkali to pit the surface and raise a slight nap. Moiré calendaring creates a watermarked effect on silk taffeta and faille fabrics. The process combines an etched roller, heat and pressure to flatten ribs into the watermarked pattern called moiré. Most silk cloth is made from cultivated and degummed smooth filament and therefore displays the smooth, lustrous qualities associated with the concept "silky." Silk textiles vary from very soft and fluid satins and crepes to extremely stiff and bouffant taffetas and organzas and sumptuous silk velvet. Interior furnishing textiles often produced in silk include ottoman, bengaline, repp, and tapestry. Duppioni silk is made from the fibers of twinned cocoons growing together; the resulting thick and thin yarns are used to best advantage in a textured, linen-like fabric called shantung. Wild silk and silk noil are spun yarns that often have sericin left in the fiber, resulting in fabrics with the appearance of a rough linen and a soft, somewhat gummy feel. Examined microscopically, cultivated silk fibers have a triangular cross-sectional shape that contributes to a soft, deep, luster and smooth feel typical of silk. 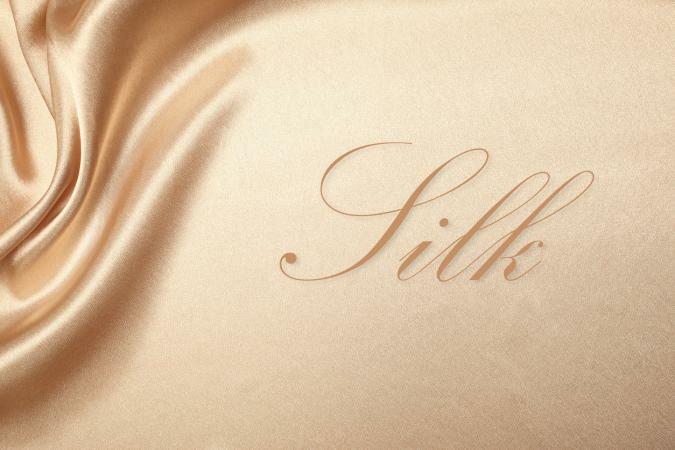 Silk has long been considered the ultimate in luxurious feel on the skin. Many synthetic fibers are engineered to emulate the look and feel of silk. Raw silk fibers are more ribbon-like, with a nearly rectangular cross-sectional shape so textiles are not as lustrous or as smooth. With removal of sericin, cultivated silk is almost white while raw and wild silk range from tan to light brown. As a protein fiber, silk is somewhat warm and very absorbent. Silk can absorb 30 percent of its weight, and dries quickly. Since it is fairly lightweight and typically smooth, silk is often more comfortable than wool for next-to-the-skin apparel or furnishings. Like wool, silk bonds with dyes and supports a wide range of long-lasting colors. In filament form, silk is the strongest natural fiber with greater durability than cotton and fine wools. Silk has a natural elasticity that allows 20 percent elongation. Since silk is subject to water spotting and perspiration stains, silk is often dry-cleaned to avoid potential detergent and bleach damage. Silk resists dirt but can be damaged by perspiration if not cleaned often enough. Silk can also be damaged by prolonged exposure to sunlight. Filament silks wrinkle less than spun silks; both must be ironed with moderate, moist heat to avoid damage. Though resistant to fire, mildew, and moths, silk is eaten by carpet beetles. Silk has historically been a prestige fiber associated with high status. In ancient China it was proverbial that members of the upper classes wore silk, while commoners wore garments of hempen cloth. With the advent of silk exportation, there was such demand in Damascus and Rome that only the very wealthy could afford it. Silk was reserved for special events such as festivals, weddings, and other celebrations, and silk wall hangings and carpet were symbols of great wealth and privilege. In the eighteenth century, the clothing of the rich was often made of silk, and as fashion designers in the nineteenth and twentieth centuries continued to produce garments for a wealthy clientele, fashion tended to perpetrate silk's aura of luxury and prestige. More recently, businesspeople "dressing for success" have considered silk shirts, blouses, dresses, and raw silk suiting to be classic indicators of prestige. By the 1930s, synthetic fibers were developed to give the look of silk at an affordable price. With the wartime decline of the silk industries in China and Japan, nylon took over most of the market for silk stockings, and "nylons" became commonly available. Acetate was routinely substituted for silk in prom dresses and wedding attire. Polyester, particularly microfiber, has been the most successful artificial fiber in emulating the look and sometimes almost the feel of silk at an affordable price. By the 1990s fashion embraced silk as a fiber that should be available to most people. Silk was reinterpreted as a textile appropriate not only for special events but also for casual, everyday wear. Very important to this expansion in silk was the creation of washable silks with a somewhat faded look and sueded silks that were closer to the aesthetic of cotton. Washable silk was also discovered in home textiles for fabulous sheets, bed coverings, table coverings, and upholstery. Silk even became adopted in sportswear as people discovered that silk underwear was warm and non-itching. Raw silk also became popular for linen-like summer attire. Silk was rediscovered not only for its beautiful fabrics, but for its great comfort and affordable price (as increased production of fiber and improved processing techniques have lowered the cost of silk). Meanwhile, the growth of the craft movement and interest in wearable art has put another kind of focus on silk as a fiber that easily lends itself to creating art that is also apparel. Silk is used primarily in apparel and interiors. The range of apparel extends from special occasion costumes to casual T-shirts and silk underwear. Considerable demand for silk for use in wearable art and craft designs has fostered development of catalog and web sourcing for silk, a textile that has become hard to find at the retail level as specialty, high-quality fabric stores have become less common throughout the country. Interior textiles are primarily upholstery, wall hangings, carpets, hand-made rugs, and sometimes wild silk wall coverings treasured for their texture. Silk flowers and plants hold a special place among interior accessories. Recently, there has been a growing demand for silk liners for sleeping bags, silk blankets and sheets. Silk is found in medical products such as dental floss, braces, and surgical sutures, prosthetic arteries, and bandages. Often wigs are made of silk. Silk is also used to make tennis racket strings, fishing lines, parachutes, and hot-air balloons. Remarkably, silk has a number of industrial uses as well, including as crosshairs in optical instruments, as a component of electrical insulation, and even as an ingredients in facial power and cream. Silk was even used in the nose cone of the Concorde jet. Nevertheless, the primary contemporary use for silk is as a fashion textile, continuing a tradition that has lasted for thousands of years. See also Fibers; Chinese Textiles; Wool. Collier, Billie J., and Phyllis G. Tortora. 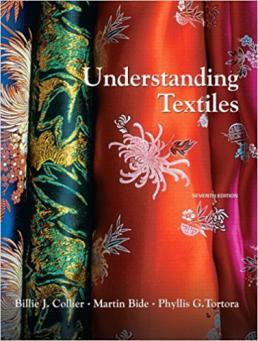 Understanding Textiles. Upper Saddle River, N.J.: Prentice Hall, 2000. Hatch, Kathryn L. Textile Science. Minneapolis: West Publishing, 1993. Kadolph, Sara J., and Anna L. Langford. Textiles. 9th ed. Upper Saddle River, N.J.: Prentice-Hall, 2001. Parker, Julie. All about Silk: A Fabric Dictionary and Swatchbook. Seattle, Wash.: Rain City Publishing, 1991.